Home | Fiber Cement Siding | How does fiber cement siding compare to brick? A report released in early January by the Brick Industry Association (BIA) compares how the material stacks up against fiber cement siding and seeks to debunk the many strengths that wall cladding manufacturers promote to help sell their products. However, a closer look at the BIA report shows that fiber cement siding, which is sold in a variety of brick-face patterns, is still a cost-effective alternative, especially in the residential market. The fact that the nation's leading brick manufacturing association released product studies comparing its product against other types of cladding materials, such as vinyl, manufactured stone veneer and exterior insulation and finish systems (EIFS) demonstrates that each type of wall cladding system has taken a significant portion of market share away from true masonry products. Lower cost. Masonry products are among the most expensive wall systems available. Weight. Manufactured cladding products don't require a "beefed up" foundation, whereas masonry requires special ledges in the foundation to provide support for laying material vertically. Paintability. Most manufactured products can be painted in the field or in the factory. Some manufacturers prefer to sell their products pre-primed to ensure their warranties. Design. Manufacturers such as Nichiha produce fiber cement brick siding with 10 different patterns to fit a variety of color and design schemes. One-stop shopping. 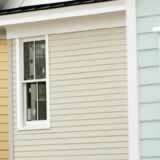 Most siding manufacturers produce a full line of accessories, such as soffits, trim and fascia. True, nothing can stand the test of time like real masonry products -- many brick buildings on the East Coast and in San Francisco are well over 100 years old. But the concerns raised by the BIA, such as strength and water penetration, aren't valid issues. Manufacturers have proven their products, even if they don't have centuries-old history and tradition to draw from. Fiber cement siding typically comes with warranties up to 50 years against manufacturer defects. If you are looking for a home that will last long after you are gone, and cost is not a factor, then a masonry product may be your best bet. But if you are renovating on a budget, and you seek the beauty of brick without the expense and weight factors, fiber cement brick siding is a great option for you.